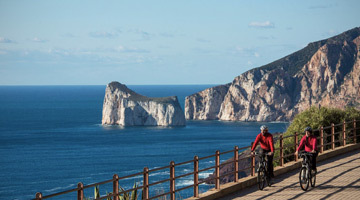 An innovative and unique approach to travel addressed to demanding clients who love “active travel”, to discover Italy’s most beautiful and authentic treasures – sustainably, enjoying outdoor experience, having fun and relying on top quality services. We look for the distinctive characteristics of every Italian region: stunning works of art, beautiful landscapes and the best traditional food accompanied by top quality wines. An accurate search for the best-in-class products and elements of each region. The trips are conducted by competent members of staff who are responsible for providing the necessary assistance as well as the contents required for a deep and valuable experience. Each group is led by two experts, followed by a service support van, in case of need. In the North-West of Italy, surrounded by the Alps, Piedmont is characterized by stunning beautiful landscapes where you’ll enjoy cycling around the sweet hills of Langhe and Roero, the areas where some of the most famous wines in the world are made: Barolo, Roero, Barbaresco, Nebbiolo… vineyards and wineries of historical heritage, for sampling and tasting the most excellent wines. This travel also means discovering castles, ancient cities and villages, guided by experts who know the places and the works of art of the region; tasting the best trues and the typical dishes of Piedmont in the most renowned restaurants; relaxing in the evening in outstanding hotels combining the charm of ancient mansions with the best modern comfort. Lombardy, with its great lakes and numerous small basins, offers a unique mix of charms to lovers of lake tourism. Visiting the largest and most famous lake of Italy: Lake Garda, Lake Como, Lake Maggiore means immersing oneself in all the flourish of a lush nature that also has the power to renew the mind and body. The gorgeous landscapes of Lombardy’s lakes bring together the fascination of villages lost in time, near-ancient castles and monasteries, superb villas, places rich in history and character, and intriguing museums. A sky-high barrier reef turned to stone defines the unique alpine scenario of the Dolomites. In 2009, they were declared a UNESCO World Heritage site, owing to their monumental beauty. 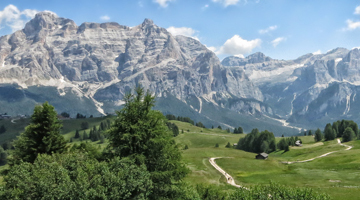 The nine components of the Dolomites are officially regarded as being among the most attractive mountain landscapes and historic-cultural contexts in the world. Excursions on two wheels accompanied by an expert guide to discover the history, art, landscape and gastronomy attractions of this region: Treasuries of the cities of art, medieval castles and hamlets, music and opera in Giuseppe Verdi’s Land, authentic flavours of typical DOP products and famous DOC wines of Piacenza and Parma Hills. 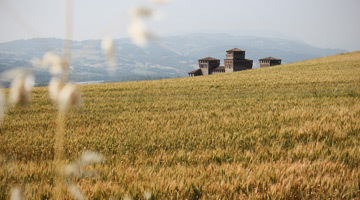 It is far from the main roads that you discover the heart, the beauty and the colours of this region: The charming landscape that e-bike riders gradually discover and enjoy, along minor and panoramic roads, on the top of gentle hills and in the fertile fields of the lively and industrious plain. In one word, “Emilia”: An authentic and stunning combination of history, nature and traditions. For cultured people everywhere, Tuscany is a place of the mind more than a real one: Probably the greatest repository of art in the world, an ideal landscape created in the Renaissance to celebrate the perfection of human intellect, and a food culture that has become the symbol of authentic, yet sophisticated, lifestyle. 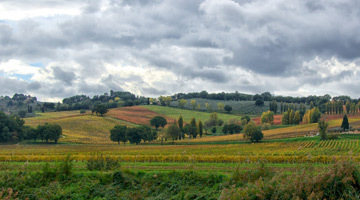 In this trip you cycle through two of Tuscany’s most iconic sites: Val d’Orcia (World Heritage Site) and Chianti. 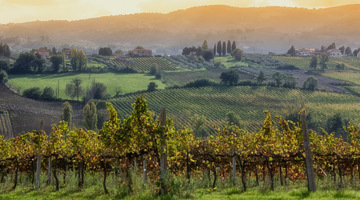 Admire the enchanting scenery, with its vineyards and cypress rimmed hills, taste genuine pecorino cheese and olive oil with local producers, visit fascinating medieval cities and stony abbeys with an expert art historian. A delightful landscape to be explored by riding your own e-bike, with medieval villages scattered among vineyards and olive groves: Umbria is an unforgettable experience, that will nurture your heart and soul. Through spectacular roads without traffic you will discover the artistic, historical and architectural wonders of the region like the cities of Spello, Assisi (where Saint Francis lived), Bevagna (with its Roman amphitheater). At the same time you may taste the most delicious regional dishes and wines; there are excellent restaurants, the most renowned wineries for tasting the amazing local wines in beautiful locations, like Tenuta Castelbuono, designed by the wellknown Italian artist Arnaldo Pomodoro. The time span covered runs from the ancient Nuragic civilization through to the Aragonese empire, from Punic and Roman times up until the mining era. From a naturalistic point of view, the landscape lends itself to countless changing scenarios: hillsides and lagoon regions, but mostly a breathtaking view of the sea and sheer cliffs, white sand beaches and the uniqueness of clear sea waters. The itinerary runs from north to south across the island, following the western coastline. 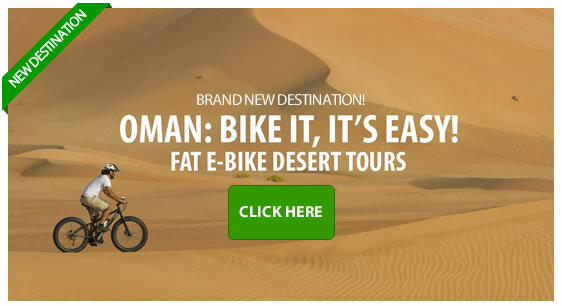 A journey for those who love genuine flavours, away from mass tourism, and in contact with nature.